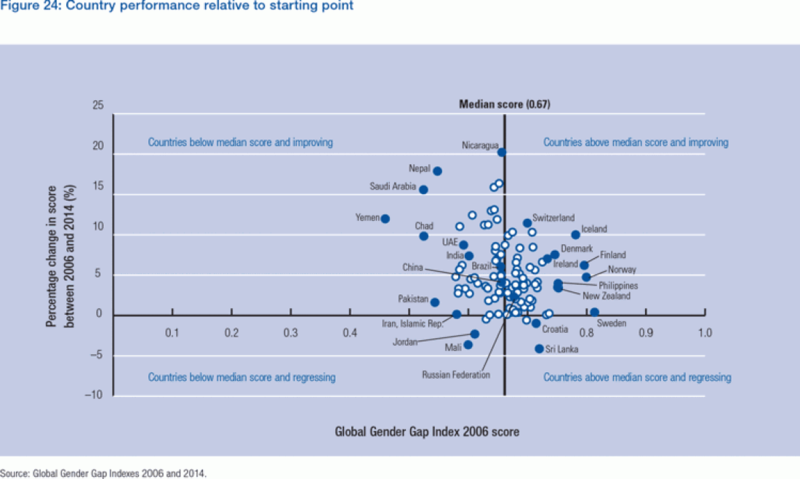 The Global Gender Gap Index was first published in 2006 with a view to creating a comprehensive gender parity index that is able to track gaps over time relative to an equality benchmark, thus providing information on a country’s progress relative to itself as well as to other countries. One hundred eleven countries have been included during that time. This year’s Report seeks to provide this information by country in the country analysis section above, particularly in the case of countries with notable progress or decline. Additionally, nearly a decade of data allows us to extract aggregate information about global progress. The main findings of this analysis are presented in this section. In 2006, 14% of the global Political Empowerment gap had been closed; in 2014, 21% of this gap has been closed. In 2006, 56% of the Economic Participation and Opportunity gap had been closed; in 2014, 60% of this gap has been closed. In 2006, almost 92% of the Educational Attainment gap had been closed; in 2014, 94% of this gap has been closed. On Health and Survival, however, there has been a small deterioration since 2006, from 97% to 96%. Figure 12 displays change by subindex between 2006 and 2014. On the Global Gender Gap Index, the region with the largest absolute change is Latin America (with 4.18% of the gender gap closed), followed by North America (with 4.06% of the gender gap closed), Middle East and North Africa (with 3.08% of the gender gap closed), Sub-Saharan Africa (with 3.06% of the gender gap closed) and Europe and Central Asia (with 3.06% of the gender gap closed). Asia and the Pacific is the only region that shows a negative absolute change (with 3.15% of the gender gap widened). When compared to their own starting points nearly a decade ago, the order of relative change is exactly the same. Figure 13 displays change by region between 2006 and 2014. On the Economic Participation and Opportunity subindex, the largest absolute increase has come from Latin America and the Caribbean (with 7.2% of the gender gap closed), followed by North America (with 6.9% of the gender gap closed), Europe and Central Asia (with 5.9% of the gender gap closed), Sub-Saharan Africa (with 5.6% of the gender gap closed), Middle East and North Africa (with 2.8% of the gender gap closed) and Asia and the Pacific (with 2.0% of the gender gap closed). Relative to the starting point in 2006, the order by magnitude of relative change is slightly different, with Europe surpassing North America. Figure 14 displays change on Economic Participation and Opportunity by region between 2006 and 2014. On Educational Attainment, the largest positive absolute change has come from the Middle East and North Africa, with 4.6% of its education gender gap being closed in the last decade. Next is Asia and the Pacific (with 3.1% of the gender gap closed), North America (with 1.5% of the gender gap closed), Latin America and the Caribbean (with 1.3% of the gender gap closed), and Europe and Central Asia (with 0.8% of the gender gap closed). In Sub-Saharan Africa, there has been an overall decline, by 2.8%, of gender gap closed. The order in terms of relative change is the same as the order in terms of absolute change. 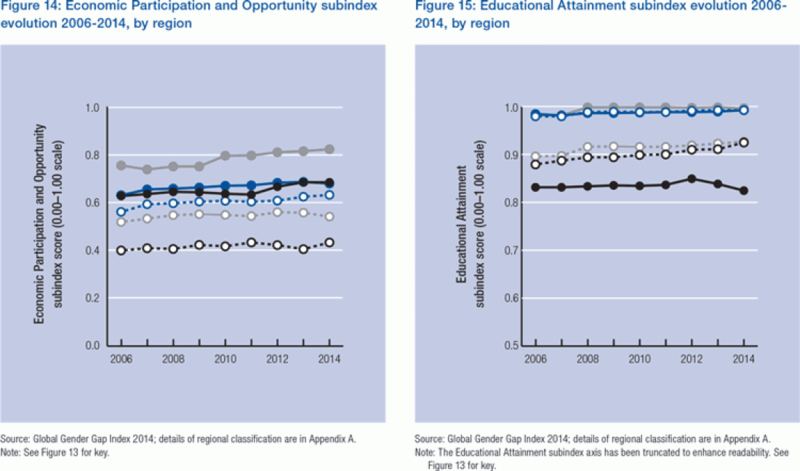 Figure 15 displays change on Educational Attainment by region between 2006 and 2014. On Health and Survival, all regions experienced an absolute and relative decrease compared to their starting point in 2006. It is the only subindex that is worsening for all regions compared to a decade ago. The smallest absolute decrease came from Latin America (with 0.01% of gender gap widened), followed by Europe and Central Asia (with 0.04% of gender gap widened). Middle East is next (with 0.40% of gender gap widened), followed by Asia and the Pacific (with 0.45% of gender gap widened) and North America (0.53% of gender gap widened). Sub-Saharan Africa (with 2.05% of gender gap widened) is the region with the largest widening of its gender gap. When compared to their own starting points in 2006, the order of relative change is different with Europe and Central Asia with the smallest decrease, followed by Latin America, Middle East, Sub-Saharan Africa, Asia and North America. On the Political Empowerment subindex, the largest absolute increase has come from North America (with 8.6% of gender gap closed), followed by Latin America (with 8.3% of gender gap closed), Asia and the Pacific (with 7.9% of gender gap closed), Sub-Saharan Africa (with 7.3% of gender gap closed) and Europe and Central Asia (with 5.6% of gender gap closed). The Middle East region, while lowest by absolute change (5.6% of gender gap closed), is highest in terms of relative change, given the very low starting point nine years ago. In 2006 only 3.6% of the region’s political gender gap had been closed; today 8.8% of this gap has been closed. In relative terms, North America comes next, then Latin America, Africa, Asia and Europe. 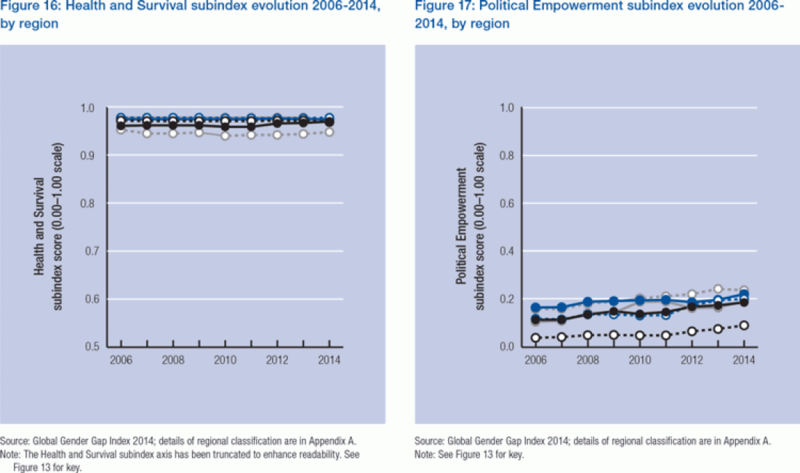 Figure 17 displays change on political empowerment by region between 2006 and 2014. On the Global Gender Gap Index, while low-income countries start out at having closed only 62.61% of the overall gap, they make gains of nearly 5%. Lower-middle income countries, while starting out lowest, make the second largest gains (3.4%). Next are high-income countries at 3.3% and, finally, upper-middle income countries at 2.2%. 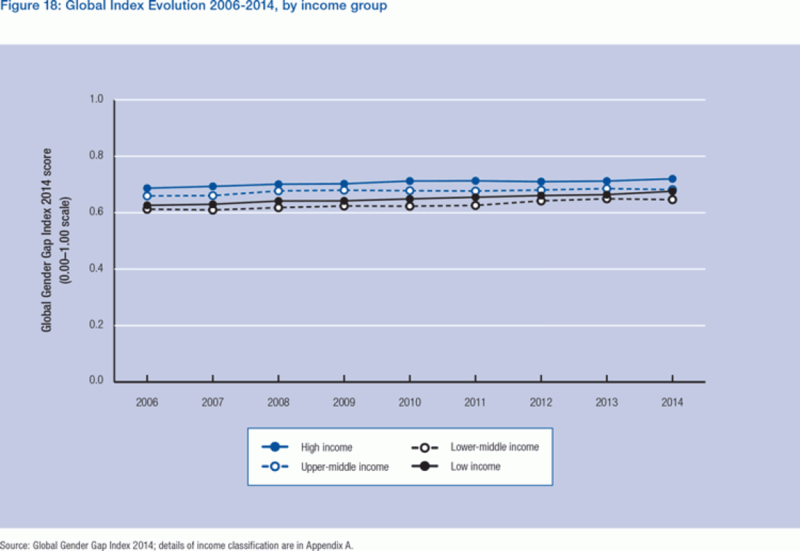 Figure 18 displays change on the overall index by income group between 2006 and 2014. On the Economic Participation and Opportunity subindex, high-income countries, already in the lead, also show the largest absolute gains (almost 7%). They are followed by low-income countries (5.1%), upper-middle income countries (3.3%) and lower-middle income countries (1.8%). Figure 19 displays change on this subindex by income group between 2006 and 2014. On Educational Attainment, the largest change comes from the lowest ranked region, as low-income countries improved by nearly 4%. Next are lower middle-income countries, upper-middle income countries and high-income countries, which are near parity already. 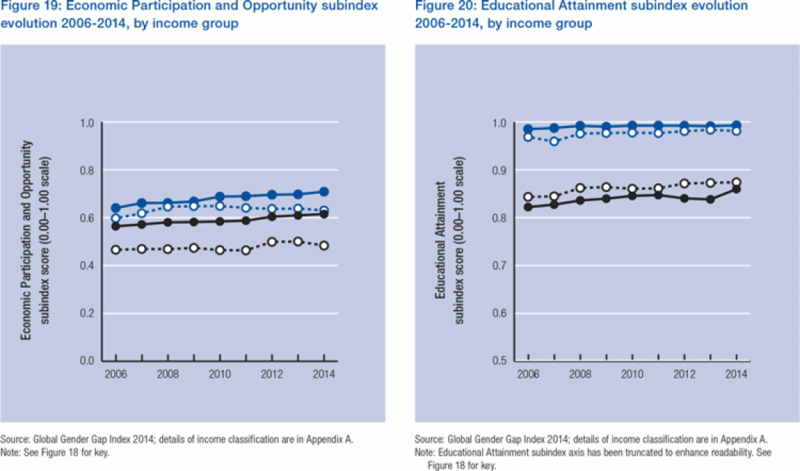 Figure 20 displays changes on Educational Attainment by income group between 2006 and 2014. On the Health and Survival subindex, the low-income countries that started out having closed 96.2% of the gender gap have now closed 96.9% of the gap. Each of the other three income groups displays widening gender gaps. Figure 21 displays change on Health and Survival by income group between 2006 and 2014. 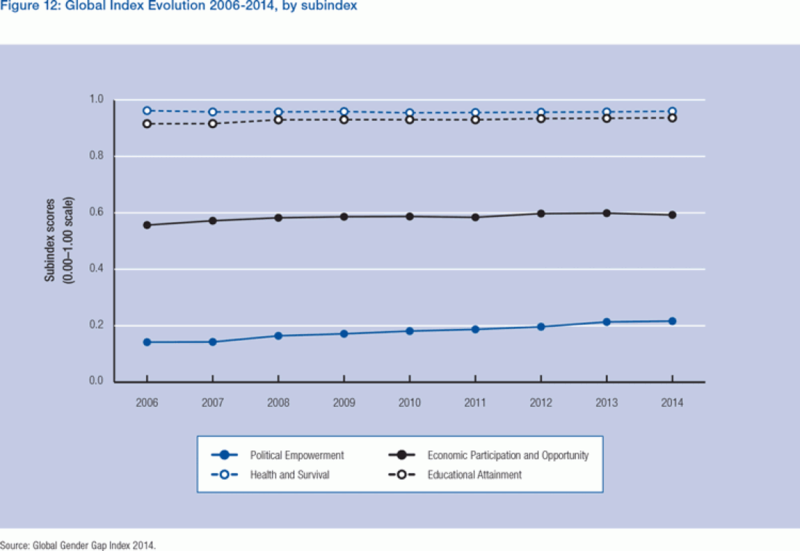 On Political Empowerment, low-income countries demonstrate the largest absolute increase (10%). Next, lower-middle income countries closed the gap from 17.5% in 2006 to 27.5%—an absolute improvement of almost 10%. 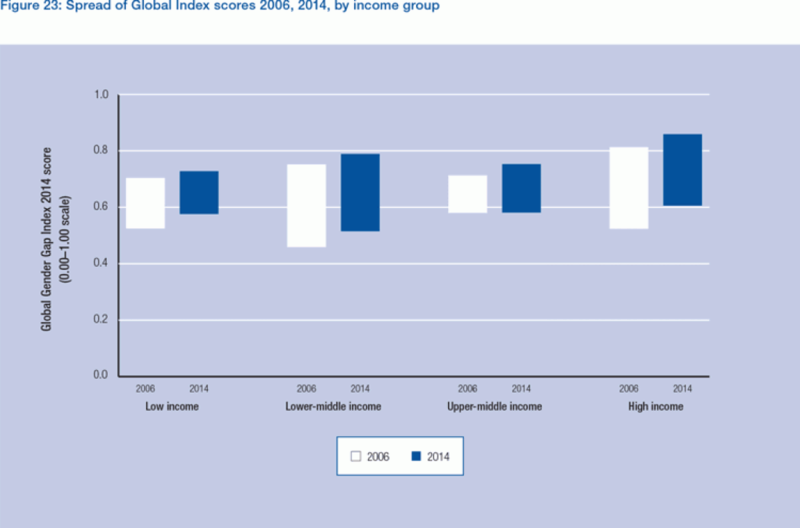 High-income and upper-middle income countries have also improved, but by a lower margin. 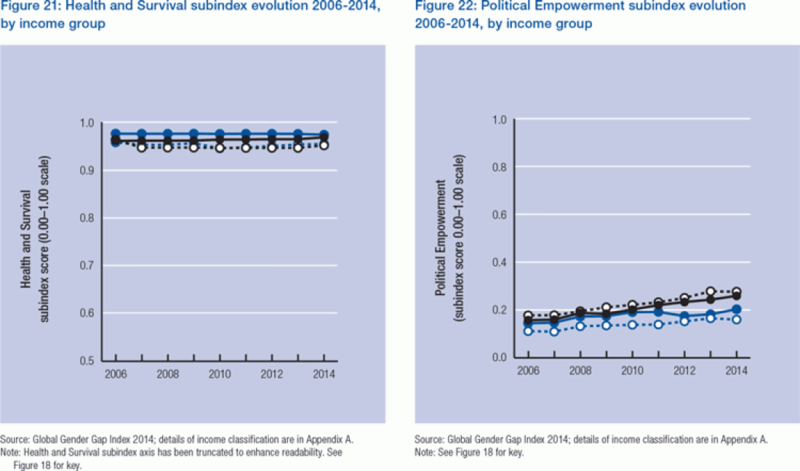 Figure 22 displays change on the Political Empowerment subindex by income group between 2006 and 2014. Figure 23 summarizes the spread of Global Gender Gap Index results within income groups in 2006 and 2014. For low-, lower-middle and high-income countries, the spread narrowed, whereas for upper-middle income countries it widened. The average income group score increased for all four regions. Figure B2 in Appendix B visualizes the country score change on the x-axis and income levels (GDP per capita) on the y-axis and highlights selected countries—both low-income countries that have made little progress or significant progress, as well as high-income countries that have made little progress or significant progress. In all, 111 countries have been part of the Report since its inception, of which one (Tunisia) dropped out of the Index for one year before re-entering. The direction of change within countries has been largely positive, but not universally so. Between 2006 and 2014, 105 countries (95%) have made progress overall, while six countries (5%) have regressed relative to their starting point. These six countries are spread across regions: in Asia, it is Sri Lanka; in Africa, Mali; in Europe, Croatia and Macedonia; and in the Middle East, Jordan and Tunisia. In the Americas, no country has widening gender gaps. Table 7 summarizes gains and losses over the last nine years. Among those that have improved, the pace of change is varied across countries. Only three countries have improved by 10% or more: Ecuador, France and Nicaragua, all three primarily driven by changes on political indicators. Twenty-five countries have improved between 5 and 10%. Sixty-two countries have improved between 1 and 5% and 15 between 0 and 1%. Table 8 provides further details of the 2006 score, 2014 score and the absolute and relative changes in each country. Figure 24 visualizes change over the last nine years in a scatter plot. Countries in the top right quadrant are those that were performing above the median score in 2006 and have shown relative progress between 2006 and 2014. Countries like Switzerland, Iceland and Denmark fall within this category. Countries in the bottom right quadrant are those that were performing above the median score in 2006 but have regressed between 2006 and 2014. Countries like Croatia and Sri Lanka fall into this category. In the top left quadrant are those that were performing below the median score in 2006 but have shown relative progress between 2006 and 2014. Countries like Nepal, Saudi Arabia and Yemen fall within this category. In the bottom left are those that were performing below the median score in 2006 and have regressed between 2006 and 2014. Countries like Iran, Mali and Jordan fall within this category. Table B1 in Appendix B provides detailed information on ranks and scores for the previous nine years for each of the 111 countries covered. In the Country Profiles section, readers can explore trends over the last nine years on the overall Index scores and ranks, as well as on the four subindex scores and ranks. It is important to note that there are gaps in international databases and not all countries have information available for all variables across all eight years, nor are all data updated on an annual basis for each country by the international organizations that serve as our primary sources of data. Progress has not been even across the four subindexes of economy, politics, health and education within countries. On Economic Participation and Opportunity, eighteen countries have regressed over the last 9 years, while 93 countries have improved. In Ecuador and Guatemala these gains are larger than 20%, while in another 25 countries these gains are between 10% and 20%. On both the Educational Attainment and Health and Survival subindexes, although many countries have already reached parity, the gains made have reversed in some parts of the world. In fact, nearly 30 countries covered have wider education gaps than they did nine years ago, while 75 have shown gains. Of those that improved, five had gains of more than 10%, having started out with a low base: Nepal, Burkina Faso, Yemen, Saudi Arabia and Chad. Six countries have stayed the same but these had already closed their gender gaps on education. On Health and Survival gaps, 51 countries are worse off than they were nine years ago and 27 have stayed the same, while 33 have had gains. Of those that stayed the same, most have already closed the gender gap on health. On Political Empowerment, 17 countries are worse off than nine years ago but 94 are performing better than before. In the case of 28 countries the gains are larger than 10%, of which five countries—Nicaragua, France, Switzerland, Iceland and Ecuador—have had gains of 20% of larger. While the Nordic nations continue to act as role models in terms of their ability to achieve gender parity, some of the biggest absolute and relative improvements of the past nine years have come from countries that are low in the rankings. For example, the most improved country relative to its starting point nine years ago for Economic Participation and Opportunity is Saudi Arabia; Burkina Faso for Educational Attainment; Angola for Health and Survival; and the United Arab Emirates for Political Empowerment. In absolute terms, the most improved countries include Guatemala for Economic Participation and Opportunity; Nepal for Educational Attainment; Angola for Health and Survival; and Nicaragua for Political Empowerment. The countries with the most losses relative to past performance are: Jordan on Economic Participation; Angola on Educational Attainment; India on Health and Survival; and Botswana on Political Empowerment. The least-improved countries in absolute terms are: Mali for Economic Participation; Angola for Educational Attainment; India for Health and Survival; and Sri Lanka for Political Empowerment. Changes within subindexes are also varied. For example, within economic participation, Nepal, Botswana and Nigeria have had the most absolute gain in terms of increased rates of female labour force participation. Kuwait, Luxembourg and Singapore have seen the largest absolute gains on women’s income. The largest gains on women in senior roles—legislator, senior official and manager positions—have come from France, Madagascar and Honduras, while on high-skilled roles in general—professional and technical workers—Bulgaria, Honduras and Ecuador have the lead. Finally, we were able to calculate the Global Gender Gap Index backwards to the year 2000 for a limited set of countries in order to take a longer-term look at trends. Table B2 in Appendix B displays the Global Gender Gap Index 2000–2013 for 39 countries where the relevant data were available. In all countries there was a net improvement in scores across the 14 years, with the exception of the Slovak Republic. In six countries there were gains of more than 10%: Bangladesh, Belgium, Denmark, Finland, Ireland and Switzerland. Figure B1 displays these changes visually for seven selected economies: Switzerland, Ireland, Mexico, Korea, Rep., United Kingdom, Japan and Slovak Republic.